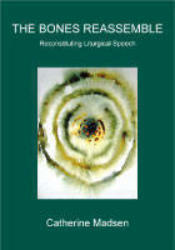 Title: The Bones Reassemble: Reconstituting Liturgical Speech Author: Catherine Madsen Philosophical and Cultural Studies in Religion Imprint: The Davies Group, Publishers soft cover 220 pp. USD 28.00 ISBN 978-1888570847 May 2005 The Bones Reassemble is an incisive and ground-breaking interdisciplinary critique of modern liturgical language. Catherine Madsen believes that liturgy has enormous potential importance as a verbal distillation of the modern condition and as a means of reordering consciousness toward responsive imagination. Unorthodox, but working in a constant productive tension with orthodoxy, she sees the language of prayer at its best, not primarily as a matter of theological assertion, but as a fusion of thought and feeling that fuels moral effort. Drawing on religious and literary studies, psychology, and cognitive science, Madsen brings theoretical sophistication and intellectual passion to the contemporary discussion of liturgy. Contents Preface Chapter One: The Power to Contain Chapter Two: The Synaptic Gospels: Speculations on Liturgy and Cognition Chapter Three: “A Good Mouth-Filling Oath”: Early Modern Style Chapter Four: Liturgy Terminable and Interminable Chapter Five: Putting the Id Back in Liturgy Notes Bibliography Index Reviews “In The Bones Reassemble, Catherine Madsen has given us…a rigorous and daring inquiry into the state of contemporary theology – specifically, the ways in which our denominations and faith communities speak of and therefore think of God.… None of us who is engaged in the formal or informal study of religion can afford to ignore this provocative book. She has transformed the discipline.” — Neil Gillman, The Jewish Theological Seminary of America “[…] Madsen’s probing and provocative work draws from sources in esthetics, psychology and neuroscience to argue that liturgical language must not fear metaphor; must not fear trauma; must reach into “the recesses of feeling,” and the dramatic heights of emotion and need; must work with the body. The Bones Reassemble, like active liturgy itself, will be worth reading and re-reading for its fullness.” — Alicia Ostriker, Rutgers University Author Catherine Madsen is the author of In Medias Res, a cycle of experimental liturgy; A Portable Egypt, a novel; the libretto for Robert Stern’s oratorio Shofar; and many essays. She is a former contributing editor to the interreligious journal CrossCurrents. by the same author, In Medias Res offers a liturgical cycle for the seasons and for life passages, sketching a religion of nature in which nature is vulnerable to history.